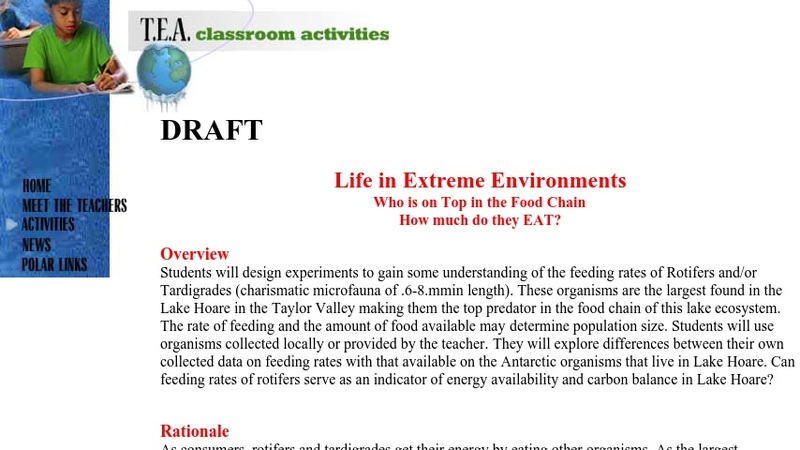 Life in Extreme Environments - Who is on Top in the Food Chain? This online lesson plan contains instructions for an experiment that teaches students about the feeding rates of Rotifers and/or Tardigrades. Students will use organisms collected locally or provided by the teacher to explore differences between their own collected data on feeding rates with that available on the Arctic and Antarctic organisms that live in Lake Hoare and Toolik Lake. The lesson plan includes a list of all materials needed, online references, objectives, advance preparation, background, procedure, and evaluation.